It can be charming to have a covey of grouse, quail, or pheasants visit the yard, but these birds can be shy and challenging to attract to even the most bird-friendly yard. Birders who meet the unique needs of these wary birds, however, can be rewarded with regular visits. Quail, grouse, and similar terrestrial birds are not typical birds when thinking of backyard birding, but they have several endearing qualities that make them always welcome in birders' yards and gardens. Their round bodies, fluffy plumage, and whimsical, bouncy topknots (on some species) are reminiscent of chickens, as is their way of scratching to stir up seeds and insects as they forage. The precocial chicks of quail and grouse species are universally cute and appealing, and it can be a treat to watch them mature over several weeks as they continue to visit the yard. These birds are exceptional at cleaning up spilled seed beneath bird feeders, providing a valuable service to birders. They are also relatively quiet and amiable birds, getting along well with other birds at the feeders rather than displaying intense aggression or territorial tendencies, and while a large covey may be overwhelming, they are rarely considered bully birds. Larger related species, such as wild turkeys and ring-necked pheasants, are generally less welcome in the yard because they can create larger messes and become more aggressive. Fortunately, these less wanted birds are also generally less common in urban and suburban areas. Catering to the shy nature of these birds when meeting their survival needs is the key to attracting quail to the yard. 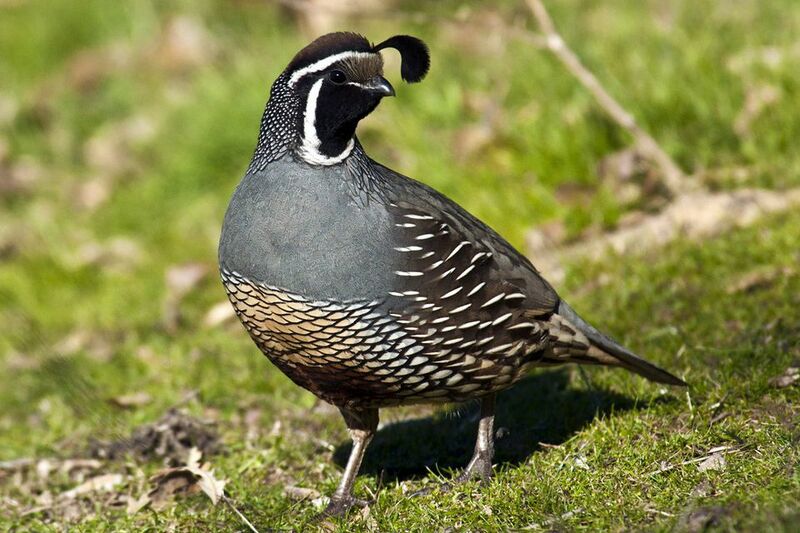 Food: Feeding wild quail is simple as these birds are primarily granivorous and will eat spilled seed from feeders. They are especially fond of millet and cracked corn, which can also be offered in ground feeding areas. Low, broad platform feeders that can accommodate several birds at once are good choices for feeding quail, or seed can be sprinkled near brush or shrubs where the birds will feel secure. Planting seed-bearing flowers or grasses is a great option for natural food sources these birds will be familiar with. Water: Grouse and quail prefer low, secluded ground bird baths with shallow basins for quick drinks or, rarely, baths. They often feel too exposed to take advantage of pedestal or elevated baths, but adding a dripper to a ground bath will attract their attention and let them know about the water source. Positioning the bath near a dense shrub can add extra security for nervous birds. Shelter: These birds feel safest in yards with abundant, dense shrubs and thicket-like patches where they can easily retreat. Coniferous or evergreen plants are best for year-round shelter, and quail may also sample berries, particularly in winter. Leaving space open underneath a deck can also provide a quick shelter, as can a brush pile. Ideally, sheltered spaces should create easy corridors through the yard so the birds can move from place to place without feeling exposed. Nesting Sites: These birds typically nest on the ground in sheltered, concealed areas. Low shrubbery should be left unpruned during the nesting season to provide additional cover, and if a nest is found, it should be left alone until the eggs have hatched. Leaving leaf litter and other nesting material readily available can encourage quail to take up residence. It can take time to attract quail to a yard, and if they don't seem to be frequent visitors, other simple steps can help make them feel more welcome. Create a dust bath for quail to use. They often prefer dusting instead of bathing in water, and will happily use a convenient dry area for a dust bath. Keep pets indoors or allow them outdoors only when closely supervised. Quail are very wary of predators and will mistake the curious attention of a friendly pet as an attack. Provide suitable perches for quail to use when guarding their flock. A lead male will often stand watch on an elevated perch as the rest of the covey feeds. Watch carefully for a covey to appear and postpone yard chores or playtime until the birds have left. If they are disturbed, they will not see the yard as a sanctuary. Choose bird-friendly landscaping to discourage cats and other predators. Quail feel at home in dense plantings, and sharp or thorny plants that exclude cats are more quail-friendly. Keep ground feeding areas open and accessible in winter, such as under a large patio table, so these year-round birds can rely on the yard for suitable food. Grouse and quail may be a challenge to attract, but once they recognize a yard as a safe, reliable refuge, birders can count on coveys to return time and again.